Thank you for the excellent website! Now I've set my heart on either Sa Riera or Tamariu or Llafranc for the summer of 2013 and I can't decide, so please help me with some advice (my first choice would have been Aigua Blava, but can't seem to find the right accommodation there - meaning beach front, because we'll be with elderly and children). Which is the most BEAUTIFUL out of the three? And another question, I found that very few Costa Brava rentals have air conditioning, is that really not necessary? 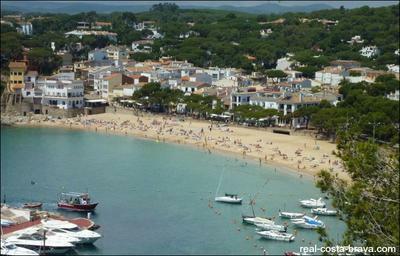 It is my first time on Costa Brava, planning to go on 1st September. I was in Costa Blanca in middle August and it was horribly hot. Glad you like our website. All three of these Costa Brava beaches are wonderful, but that’s not very helpful is it, so let me give you a little more information to help you make up your mind as to which one is most suitable for your family. Click on each photo above to see it bigger! Sa Riera has 1 small supermarket, 6 restaurants/cafes (serving Catalan food, pizza/pasta, seafood, Mediterranean food, Vietnamese food), 1 bakery, a beach shack selling snacks and drinks (in height of season) and a couple of tourist shops. There is also a twice weekly market at the height of season. It’s only 2 km to Begur (quite a big town), but it is up hill, so I don’t recommend walking if you have children and elderly people with you. There is a bus service from mid-June to mid-September. The beach is sandy (300m in length and 65m wide). There are showers on the beach. The beach shelves away quite quickly so be careful if your children are small. My advice with rental properties in Sa Riera is to check how much of climb it is back up from the beach. Most of Sa Riera is built into the headland and so although a villa may only be 5 minutes from the beach it could be a steep climb! Tamariu has 2 small supermarkets, 7 restaurants/cafes (serving Catalan food, pizza/pasta, seafood, Mediterranean food), 2 bakeries, and a couple of tourist shops. It’s only 5 km to Palafrugell (a large town). There is a bus service from mid-June to mid-September. Tamariu has one main beach (180m in length and 50m wide) which is south facing and sheltered, with a smaller beach to the right that has a diving board attached to the rocks (great fun for your children...and you, if you’re anything like me). There is also another tiny beach on the other side of the main beach. All of them are sandy and shelve away gradually. There are showers on the main beach. Take a look at the Tamariu beach webcam. There is a habaneras festival (singing of sea shanties and drinking burnt rum) held on the beach of Tamariu right at the beginning of September. It's good fun, but noisy. You can also rent kayaks on the beach. 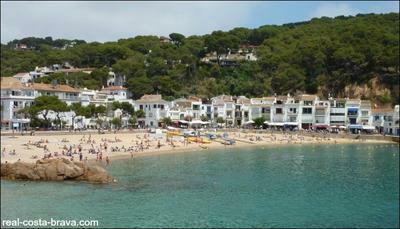 Llafranc is the biggest village out of the three (but it still isn’t very big) and is a little more cosmopolitan (i.e. more expensive). It has 2 supermarkets, 14 restaurants/cafes (serving Catalan food, pizza/pasta, seafood, Mediterranean food, Peruvian food), 2 bakeries, 2 scuba diving schools and a few of tourist shops. Like Tamariu, it’s only 5 km to Palafrugell from Llafranc. There is a bus service from mid-June to mid-September. The beach is sandy (330m in length and 40m wide). There are showers on the beach. 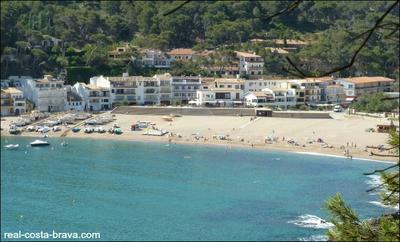 Like Tamariu, Llafranc is a south facing relatively sheltered beach and shelves away gradually. Take a look at the Llafranc webcam. You can take boat trips from the small harbour at one end of the beach. Take a look at our climate Costa Brava page. On average it is 3-4 degrees centigrade cooler in September than in August. The Costa Brava is also cooler than the Costa Blanca as it is further north. I would say that most Costa Brava rental accommodation does not have air conditioning. I have rarely found it uncomfortably hot, especially in September. You should be able to rent a fan from the agent you rent the villa from, if you wish. Hope that has made your decision a little easier. As I said at the beginning all these Costa Brava beaches are great and I don’t think you’ll be disappointed which ever one you choose. All the best for a fantastic holiday! Thank you for this post - I couldn't make up my mind between Tamariu and Llafranc. Think I'm going to choose Tamariu...but then again, I had never even considered Sa Riera and that looks lovely too!